A simple registry of tracer instances associated to map canvas instances is kept for convenience. (Map tools do not need to create their local tracer instances and map canvas API is not "polluted" by this optional functionality). Definition at line 40 of file qgsmapcanvastracer.h. 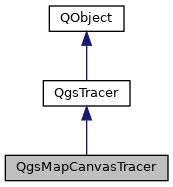 Create tracer associated with a particular map canvas, optionally message bar for reporting. Definition at line 33 of file qgsmapcanvastracer.cpp. Definition at line 53 of file qgsmapcanvastracer.cpp. Access to action that user may use to toggle snapping on/off. May be nullptr if no action was associated. Definition at line 62 of file qgsmapcanvastracer.h. Access to action that user may use to toggle tracing on/off. May be nullptr if no action was associated. Definition at line 50 of file qgsmapcanvastracer.h. Sets configuration from current snapping settings and canvas settings. Definition at line 98 of file qgsmapcanvastracer.cpp. Report a path finding error to the user. Definition at line 63 of file qgsmapcanvastracer.cpp. Assign "enable snapping" checkable action to the tracer. The action is used to determine whether snapping is currently enabled by the user. Definition at line 69 of file qgsmapcanvastracer.h. Assign "enable tracing" checkable action to the tracer. Definition at line 56 of file qgsmapcanvastracer.h. Retrieve instance of this class associated with given canvas (if any). Definition at line 58 of file qgsmapcanvastracer.cpp.